For about ten years, now, I’ve been getting this pain in my neck every once in a while. I imagine it’s some kind of pinched nerve, or something of that nature, but since it’s only occasionally, I never sought any kind of treatment for it. I call it my “tourette’s neck,” because it sometimes makes me jerk my head to the side when it happens. It happened during our wedding ceremony and it was all I could do not to jerk and twitch. I didn’t, thank goodness. It hasn’t happened in a while, which is good. Last August, I had my right rotator cuff surgically repaired, and it has never been the same since, not really. I have my range of motion back, but it still hurts pretty good most mornings, like maybe Dr Peare forgot to put something back in. Over the past week or so here in Yakima, both things have been bothering me, on and off. My shoulder, especially. I know Jenny has been having a hard time of it as well, and I’ve been missing her and the boys something terrible. Last week, I went to a church Jorge told me about, and it was amazing. It’s called Changing Pointe, and if you’re ever in Yakima, that would be the place I’d send you. Last week it was about “Surviving the Pressure,” and it was right on point (I need to get Jenny to listen to it). At the end of the service, Pastor Eli did an altar call, and probably 30 or so people came up. Never seen such a response to an altar call. He prayed for everyone, and found a way to lay hands on each and every person for just a few seconds while he did it. So another week went by, and every day I missed Jen a little bit more. I had lots of time to think, and what I mainly thought about is how I have to do better for my kids. I’ve got the providing part down, and God has really blessed my wife and I financially over the past year. The part I struggle with is leading my family–in giving them an example of what it looks like to really love God, and give everything to him. I mean everything in the sense of myself, by the way. Today, father’s day, the sermon was the second in the Surviving the Pressure series, with an understandable segue toward what this day means to fathers and children. There was a slide presentation for Pastor Eli some folks made, and while it played a man on the praise team sang a song the Pastor had written, and it was really beautiful. I was a wreck before the sermon even started. Plus, my shoulder was burning, and I kept jerking my head around like one of those Roxbury guys on SNL. Fathers, what do your children see you doing as an outlet for pressure? Crap. My kids see me get mad, or lash out in some way, or simply retreat and clam up. The other was, Dads, don’t lose heart. Find a way. Lead the way. Exactly what has been on my heart lately. In fact, it would be fair to say this was one of those times when it seemed like a pastor was talking directly to me the whole time he was in the pulpit. And the thought that occurred to me today was in the form of the Sanctus Real song “Lead Me,” which absolutely destroys me every time I listen to it. So that was in my mind when Pastor Eli got to the end of his sermon and to the invitation part. I don’t remember much of what he said at that point, exactly, but it was something about dads and pressure. And leading. And finding a way. I thought about going up there, and then decided against it. Then I figured there would be thirty people again, and I could be relatively anonymous. The urge to go was almost overwhelming, so up there I went, and you can probably guess what happened. It was just me. So there I was in front of the stage, and the music started swelling loudly. He placed his hands on my head and began to pray–I couldn’t hear a word he said, but it didn’t really matter. He placed both of his hands on my neck for a few seconds, and then on my shoulders. Had my stress and tension been that obvious? I couldn’t hear his words, but I could feel them. My shoulder loosened up, and my neck stopped twitching. I stood there for a few more seconds, and then he shook my hand and that was it. I went out to my rental car and listened to the voicemails my kids had left while I was in church. Started crying like a schoolgirl again, and then I sent a video message to my wife for them to listen to (it took me two tries before I could do it without tearing up). Finding a way. Leading the way. How can I expect my kids to behave in a way I don’t behave myself? How can I be an example to them if I do not follow the example Christ set before me? Funny how sometimes things just fall into place. 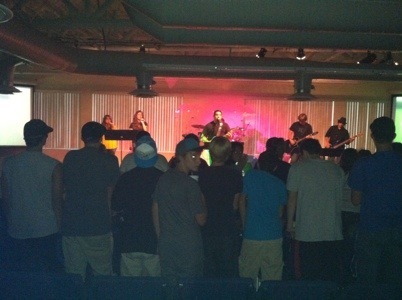 Jen and I went to the Wednesday night youth service last night, and it was really good, even from the cheap seats. This particular service was a little heavier on music than usual, but the music was awesome, led by Sam. It was probably one of the more memorable evenings at church I’ve had in some time. What made the night stand out for me was not what I would have expected. Sam and the band were great, and Zeb’s sermon was convicting (I’m sure he was talking directly to the old guy in the back row), but it was this young man next to Jen that got to me. I know him a little, and he’s a really great guy. He’s probably only a year or two removed from youth group himself, but I don’t think I know another person of any age I’ve seen worship with such abandon. I was truly in awe of this young man’s total submission to God during the service. We didn’t speak last night, but every time I would glance in his direction he was worshipping on a level I’ve never gotten to. Raising his hands, singing at the absolute top of his lungs–it was a beautiful thing. Just him and God. I hope I can get to that point. I want to praise and worship like that–as if no one else is in the room. As it is, I’m probably a little beyond self conscious when it comes to worship. I’m not one of those people who is unaware of his own presence in a room. I’m typically one of the largest people there, and if I kicked it up more than a little during worship time, I’d probably look like a manatee having a grand mal seizure. So I usually just chill out and do my own thing, even though I sometimes feel my own thing is not necessarily the best I can give God. The young man last night was definitely giving it all he had, and didn’t give a rip about who was in the room, and whether or not they were paying him any attention (though people downstairs may have heard him singing). It was a great night, and gave me lots to think about. Plus, Magen was holding a really cute puppy. Here’s the sermon from the church I visited a couple weeks ago. Definately worth listening to. It runs a little over 30 minutes. Very timely. The pastor talks about the power vows can have over us, among other things–such as unforgiveness. This is a sermon I heard a little over a year ago. It’s given by a man named Sy Rogers, and while he speaks a bit about his struggle with homosexuality, what it speaks to in a larger sense is the title of the message: Keeping Clean in a Dirty World. Take a listen if you have a chance–it’s about 45 minutes long.